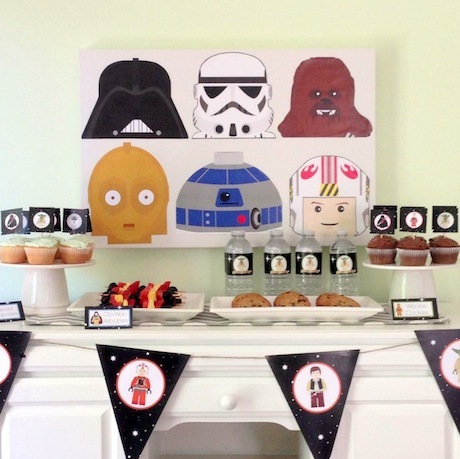 Star Wars Lego Birthday Party Ideas, Invitations, Photo Props, Printables and more! Some of you know I am planning my son’s Lego Star Wars Birthday Party for the end of February. It is hard to find things without Googling endlessly for ideas so I figured I would share some of the ideas I have found here. Some ideas I will/am using and others are just too cute not to mention. Of course I will post my own photos from the party in another post whenever we get there. Even though the end of February seems so far away it is coming up really quick! 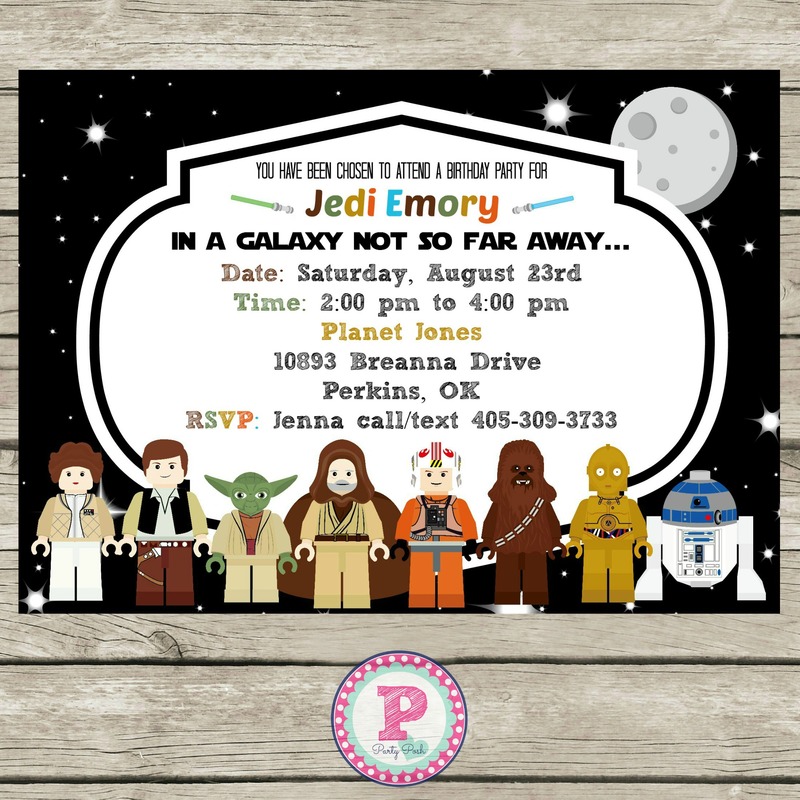 These adorable Lego Star Wars Birthday Party Invites can be found at Party Posh Printables.com. They are personalized with your own information and have the cutest characters! There are even Photo Props, yes the up coming trend of photo booths is huge and these adorable Lego Star Wars themed photo props are a can’t miss addition to this party set. Complete with Birthday Cupcake Toppers and Water bottle labels. There is even a matching Birthday banner. Check it out Party Posh Printables on Etsy or on Facebook here. Check out how Sarah Gunn from @SarahGunnStyle on Instagram used the same printables (Photo Props she used modge podge and a canvas) to create this fun party setup! Don’t forget to pin things to Pinterest to reference them later! Next I needed ideas for party favors. So let’s start with Party Favors. I found these inexpensive Inflatable Light Sabers which range in price from around $2.50 a piece up to $4.00 and over. I included a link to parties4kids where they were on sale for $2.59. I can’t take all the credit for this find. 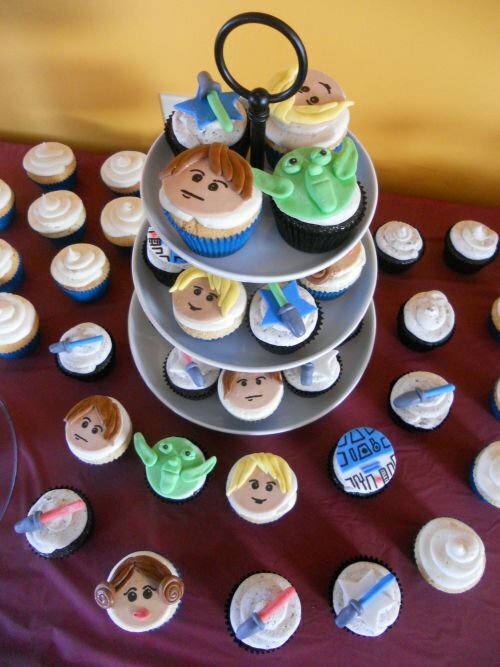 I was googling and came across this mom’s blog My Little Jedi and found a post about her son, Aniken,(yes she named her son Aniken so you know this has to be a good Birthday Party Post) for her son’s 1st Birthday Party. She had a picture with the light sabers and also the cutest Jedi Training Certificates. 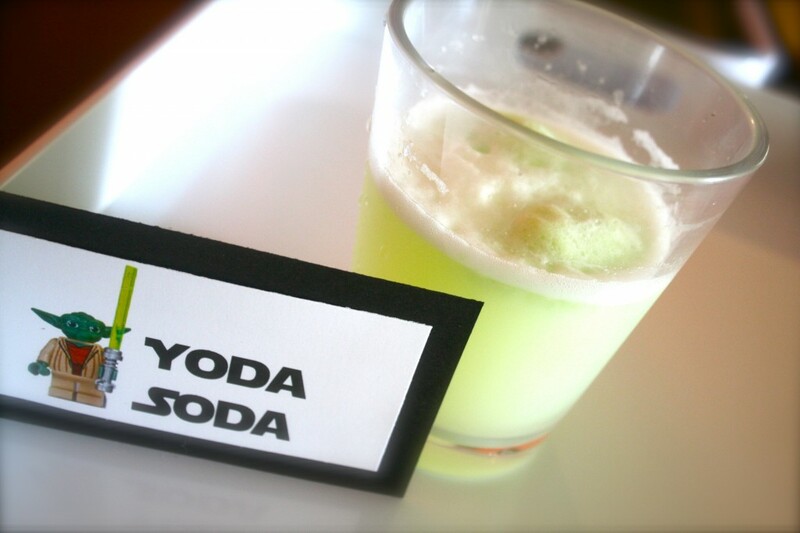 Definitely check out her blog post for more great Star Wars Birthday Party Ideas! She even had the cutest Setup for a Candy Buffet Table. Now if you aren’t super adventurous with fondant I don’t suggest trying to make these next Lego Star Wars themed cupcake toppers. However if you are check this out, Marshmallow Fondant Recipe, which tastes exactly like Marshmallows!! It is super yummy. I made these adorable toppers and am including them in this post since they go with the theme. My son loved them and they were a big hit at the party. If this is too much work for you Party Posh Printables has some cut out and place on a stick kinda Lego Star Wars toppers here… easy peasy. 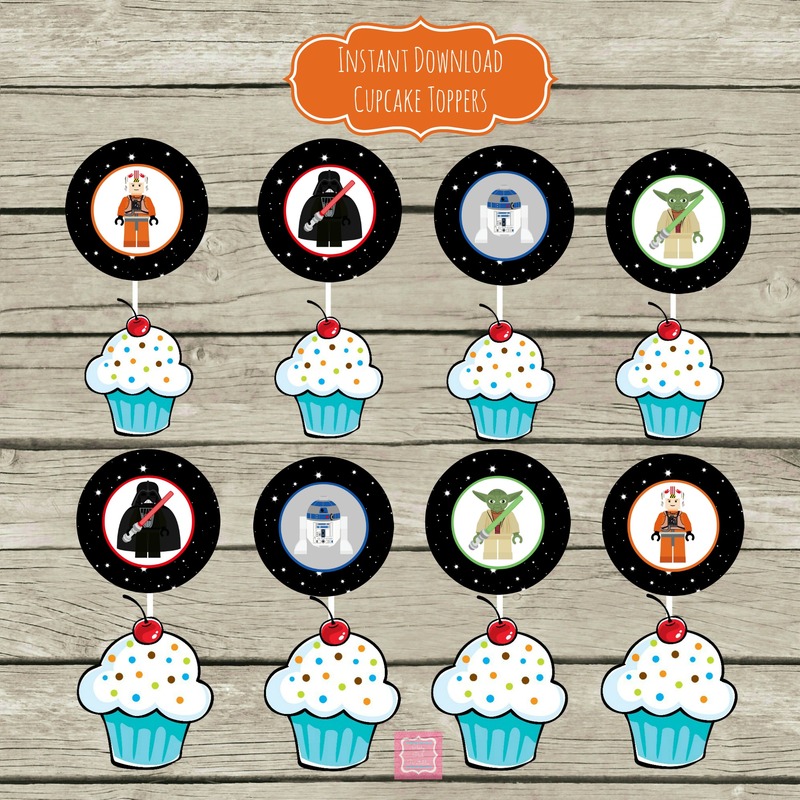 Lego Star Wars Fondant Cupcake Toppers – Bear Heart Baking Co. Robot Valentines Day Cards, Printable! Juicy Couture Jewelry Box Cake with Tea Cup Charm Cupcakes! New Logo Samples! What do You think?? Buy Gourmet Chocolate Chip Cookie Sandwiches Online! York, PA Bakery makes a Disney Princess Castle Cake! Good ideas and designing of the party them.Thanks for this article with detail information. I like the Lego Indiana Jones invitations. I love birthdays oh so very much….that being said, every year since I was 13, I’ve had a party on my birthday which last the whole week of my birthday because I could never get anyone organized for my actual birthday or it fell on a school day or something. It makes my birthday week pretty awesome. Hi there! Love your party!! Just wondered, where did you find the yoda clip art? I am having a candy buffet at my sons upcoming birthday party and wanted to label all the candy after characters but can’t find any nice clip art and I loooove the Yoda you used!! « New Logo Samples! What do You think? ?